1941 Mercury Convertible with full fadeaway fenders and chopped padded top. A Mystery Published Custom Car. Over the years I have come across a lot of Unidentified Custom Car photos in the early Custom Car Publications. Mystery Customs that appeared in just a single publication, and sometimes even in multiple magazines or booklets, but always lacking any info on the original builder or owners name. In this series of articles I will be showing some of these Mystery Published Custom Cars, and hopefully the extra publicity will lead to some more information on these cars. Original article from 2016, updated in April 2019. 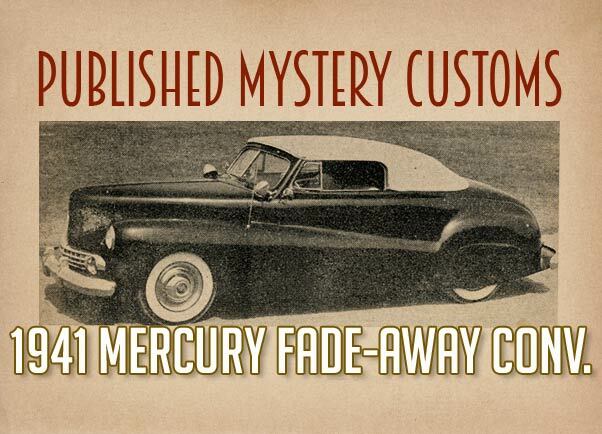 The first “Published Mystery Custom” is an very nicely done 1941 Mercury Convertible with full fade away fenders, chopped windshield, padded top and somewhat odd looking Lincoln grille. 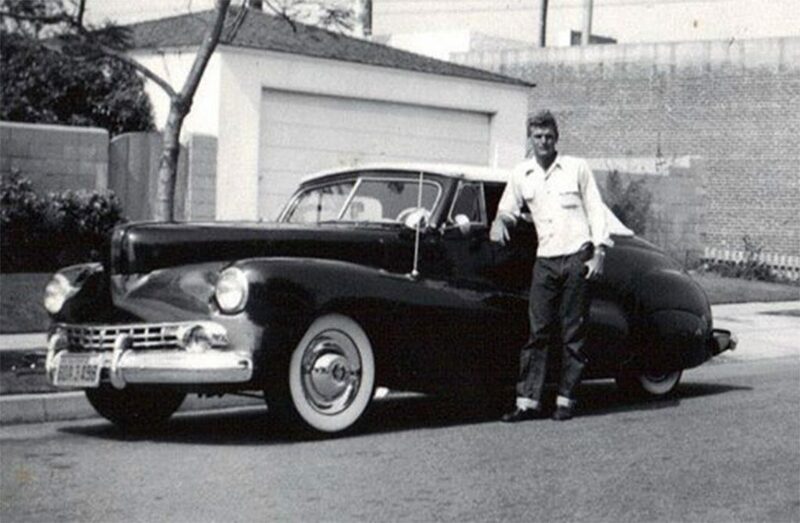 The first time I saw a picture of this car was on Pat Ganahl‘s “The American Custom Car” book. 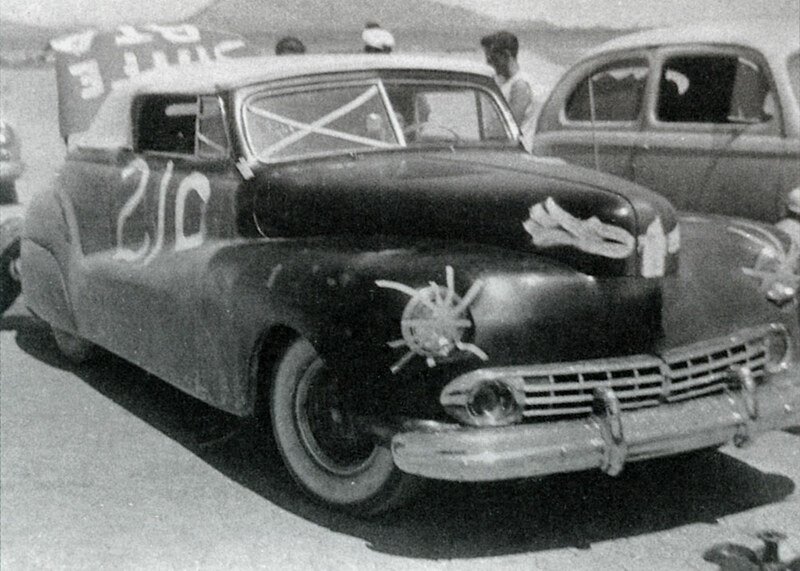 On page 24 of this book he shows this mercury Custom with taped headlights, windshield and race numbers on the side at one of the Russetta Timing Association events. It is unsure when this even took place, but most likely around 1950. Perhaps one of the contender lists would reveal an owners name for this 1941 Custom. 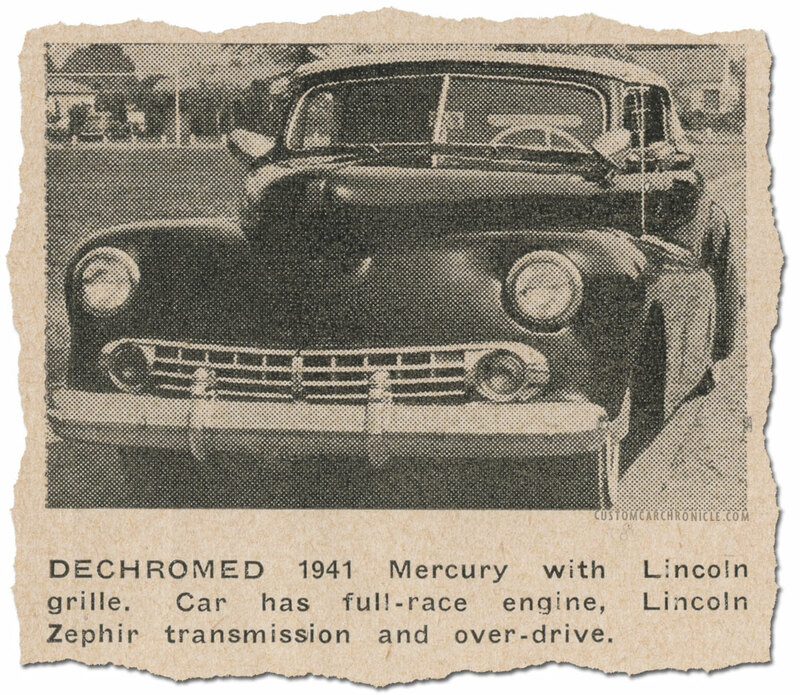 Pat wrote in his book that the car was an Ford, but later I found more material showing that the car was actually Mercury based. Pat Ganahl writes this about the photo in his book: While customs were built more for style than peed, some did turn up at the dry lakes, where heavy weight wasn’t a hindrance and streamlining actually helped. This anonymous Postwar Ford with Lincoln grille, chopped padded top, and full fade-away’s was competing at Russetta Timing Association meet. 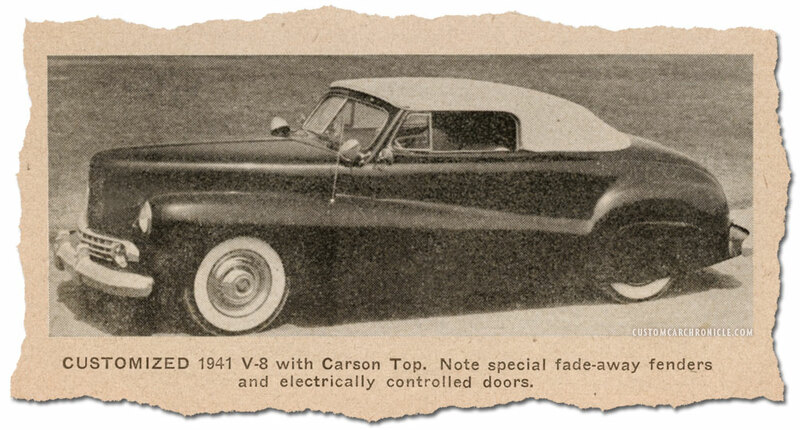 The other place I have found photos of this Custom was in the 1951 edition of the Speed and Mileage Manual by Edgar Almquist. 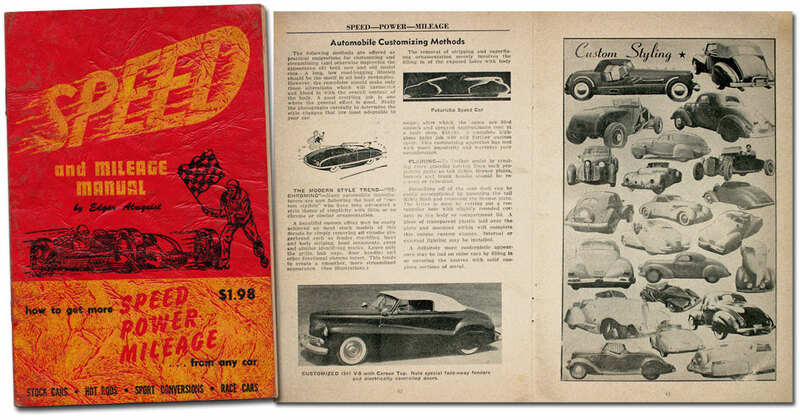 The first edition of this manual was published in 1947, but I’m not sure if this ’41 Mercury was already part of it then. The side view shown in the Almquist Manual shows the really fantastic Custom restyling of the car. The full fade away front fenders, the molded in rear fenders and shaving of all the trim. The second photo of the car shown in the Almquist manual gives us a better look at the low mounted Lincoln grille, the reshaped front section and the stock headlights rings. The Windshield was chopped, but very conservative, perhaps around 2 inches. The front bumper appears to be a 1942 Buick Special rear bumper with the guards moved closer together. The 1941 Mystery Lincoln looks to be a very nicely restyled Custom Car, most likely created by one of the top shops in the later part of the 1940’s or around 1950. The full fade-away fenders done this way, all molded to the body with nice leaded edges, was something both the Ayala’s as well as the Barris shops were well known for. The overall proportions are right on the money, and even though the Lincoln grille is now considered and odd choice, or perhaps better said not the most attractive, back in the mid/late1940’s they were used on more Customs and considered a high-end choice. 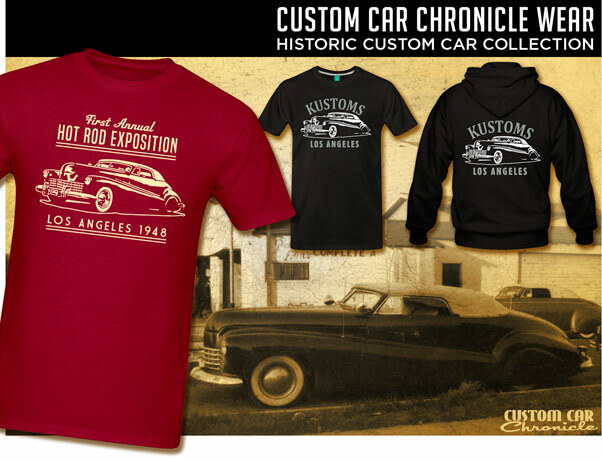 Around the late 1940’s a lot of full Customs were produced and there were not to many magazines out there that could or would published these cars. The owners and the Custom Builders did not take as many photos of their projects as we all would have liked. And even though this Custom Mercury did get published back then, there was no mentioning of the builder to help promote his business. In 2019 this photo of the Mercury was shared on Facebook. So far I have been unable to find out where the photo was taken and who shared it originally. If anybody knows more about the photo location, or who owns the photo, please let us know. 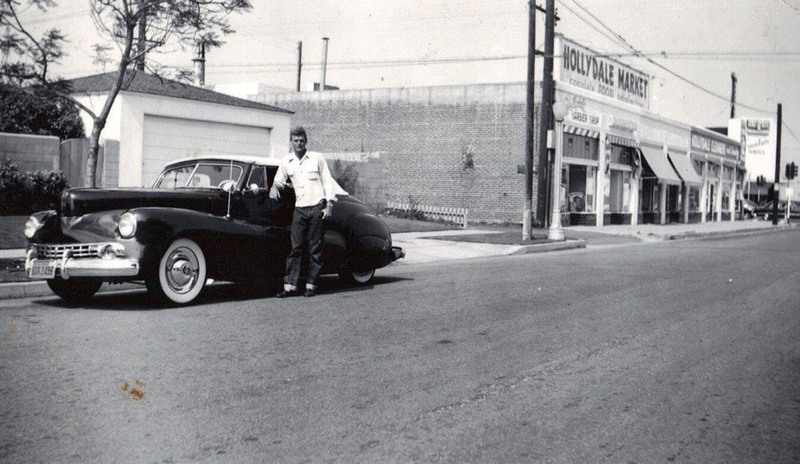 Enlarged section of the photo shows that the car has 1948-50 California license plates when this photo was taken. Most likely with the unknown owner standing proudly next to the car. The Lincoln grille is considered an odd choice today, but back in the 1940’s it was used a lot. From what I can see in the photos the newest parts used on the car are from 1947, Cadillac Sombrero hubcaps. So this version of the car could not have been created before 1947. The padded top has a nice flow on the back and a straight B-pillars, most likely the same upholstery shop did a full custom interior for the car as well. Who knows more about this rather nice 1941 Mercury Convertible Custom with full fade-away fenders. Who was the original owner, and who built it. Hopefully one of our readers remembers this car from back then, or has seen more photos of it. 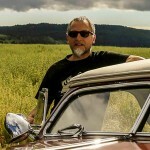 If so, please let us know and send Rik an email here at the Custom Car Chronicle. 1940 SAM BARRIS MERCURY…. Who has it..? That is a good looking car for sure Rik! I wonder about the year ..only because the pre-war Fords and Mercurys didn’t have the wide centre bit running down the hood. Perhaps a collision initiated the customization? I does look like the fenders and hood are the longer Merc bits; and I think(!) the Merc hood has less of a “drop” in the leading edge to the grill than have the Fords? Just stirrin’ the pot a bit – lol. I had noticed that too Dave… And doubted about the year. But in general magazines/booklets rather would mark a car newer than older especially back then. Also the 46-48 Merc have this extra edge on the top of the fenders which the 41’s do not have. Perhaps the hood was taken from a 46-48 model… Hopefully one day we will know for sure. I think you must have been a detective in a previous life Rik! As always, another interesting bit of customizing history. I love this car. I even love the Lincoln grille. Really dig the car, but can’t get into the grill. The 41 Merc grill would fit so well up against those fadeaways. Those fadeaways are so nice I wouldn’t doubt Jimmy Summers had a hand in this kustom…if he didn’t do all of the metalwork. That Lincoln grill was the same on both Zephyr and Continental from ’46-’48, so this could have been done in late ’45 or early ’46. Looks like all they did was remove a little bit of the center section of the stock Lincoln grill. It’s not terrible…I like how the grill gives the car that early kustom look vs. the later, more refined Olds or Cadillac options. Hopefully some history pops up on this one! Killer looking kustom…really dig the fadeaways and Lincoln grill. Head light treatment reminds me of Bailon’s Miss Elegance.